If you are looking for a special present that attaches an intense personal value then a customized handout is one of the meaningful and substantial alternatives to gift your dear ones. Short on the idea for a beautiful, useful and impressive personalized gift? Don’t worry, we have the best solution to offer. The below mentioned 10 personalized gift items from Things Remembered will definitely inspire and fix you with an unparalleled match. This unisex classic canvas duffel bag is perfect for traveling and can also be carried along at the workplace. 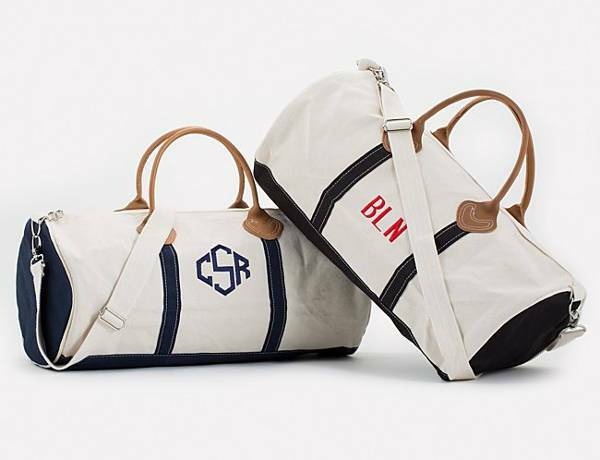 The bag can be personalized with a monogram or a message. The duffle bag has plenty of room to pack the things for quick out of the town trip or the dorm necessities. This chic personalized infinity hinge bracelet features two shiny infinity symbols which rest next to each other. The bracelet also carries a dangling charm which can be engraved with the name. The bracelet can also be monogrammed with a special message on the front and the back. 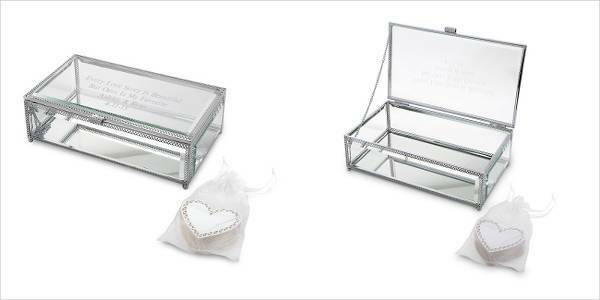 The glass wishing box is one of the unique and beautiful ways for your wedding guests to sign in. Engrave the top of the box with the names, wedding date and a line from the vows and a brings a new twist on the personalized wedding guest book. The box features an iron frame, mirrored bottom, and glass construction. The guests can write the message in the heart shaped lyrics from your song. 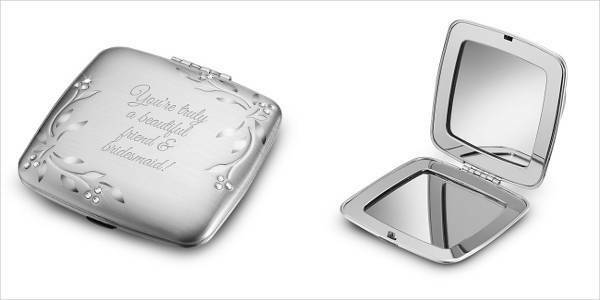 This Leaves and Vines silver compact can be personalized with a message engraved on the lid. 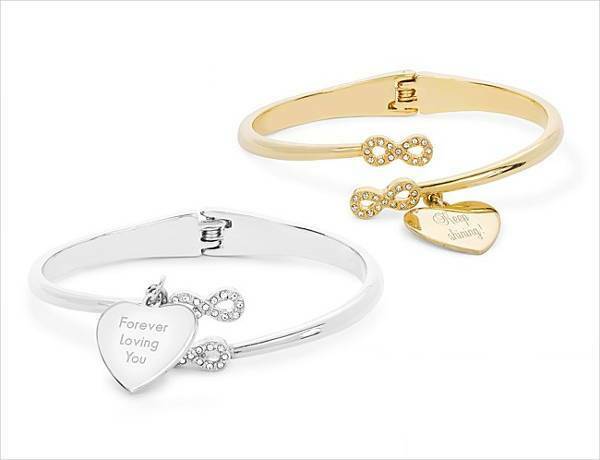 A beautiful way to remind your dear friend or fiance how important she is to you. As she would carry the compact every day, she is sure to think of you every time she pulls it out from her purse. Custom engrave the message for her on the back of this classic watch from the timepiece innovator Seiko. The personalisation will definitely make it as a great anniversary present. The love always ring box is perfect for popping the question or even holding the ring on the big day. 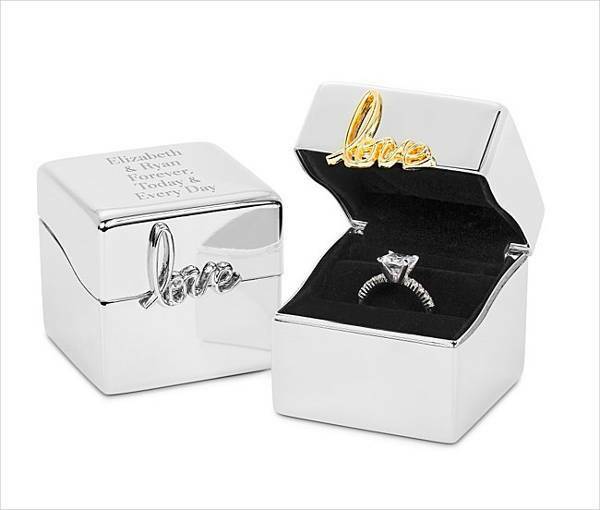 Engrave the names, engagement or wedding date on the top of the personalized ring box. 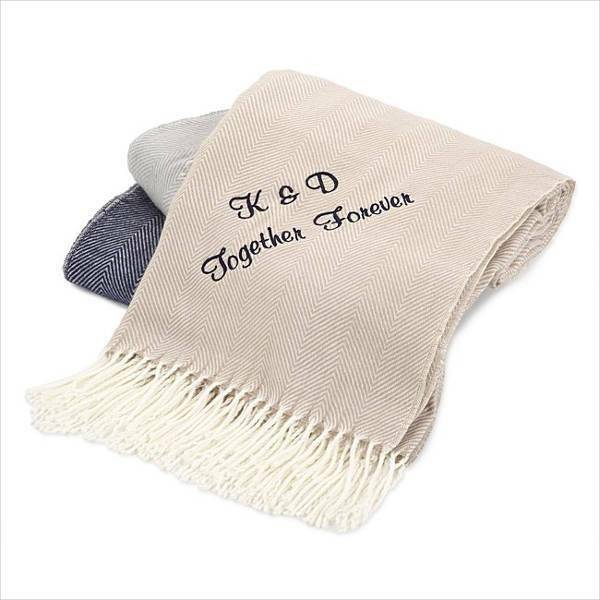 Along with the cozy and comfy, the personalized Herringbone home throws can be embroidered with a personalized message, which can either be a name, monogram, initials or even a special message to make it complete. This personalized diamond necklace is crafted in sterling silver with genuine diamonds. 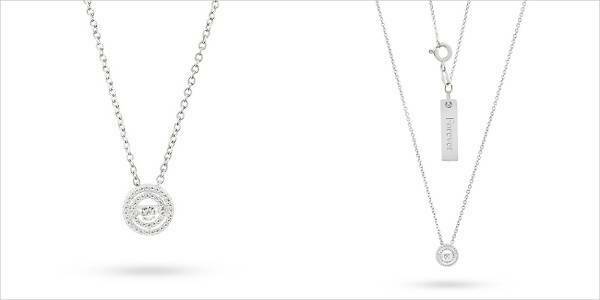 The necklace features a beautiful pavé circle pendant of continuous motion. You can engrave a personal message just for her eyes on the small charm at the clasp. 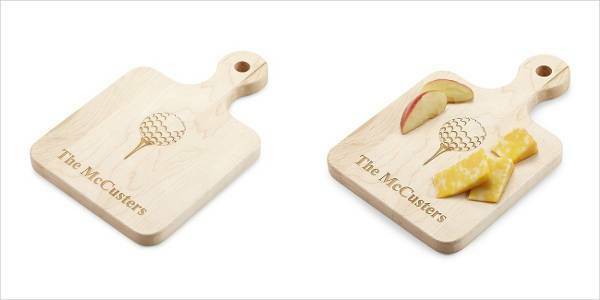 If you are looking for a personalized gift for your golfer friend or dad, then this cutting board with golf design can be engraved with his name or best score. The gift is perfect if they like to entertain while watching a game. 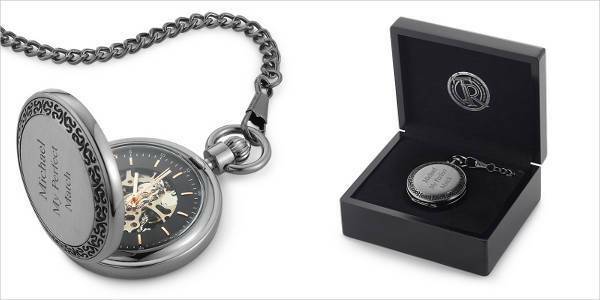 This hand-wound pocket watch showcases the skeleton mechanical movement that makes it a valuable gift for the special groomsmen’s or Christmas gift. 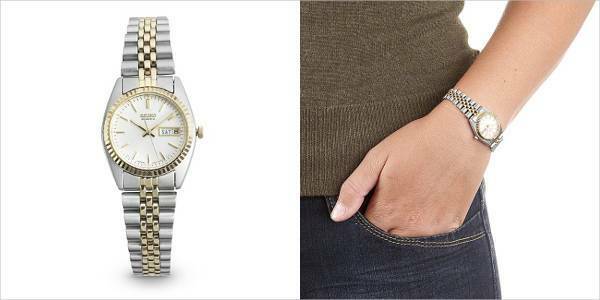 The stainless steel watch features a gunmetal finish that contrasts with the gold-tone mechanical movement and hands. You can engrave on both the sides of the watch and also the lacquered wooden gift box. Pick your favorite personalized gift and make the exchange extra special.